Admire sweeping views over Arthur’s Seat, an iconic Edinburgh landmark, from our stunning one-bedroom apartment. Located on the third floor of a modern, recently refurbished building this luxury apartment is the perfect holiday accommodation in Edinburgh city centre. As you step inside, you’ll discover a modern holiday apartment with comfortable furniture and stylish decor. The living room has plenty of natural light from the large windows, which overlook Holyrood Park and Arthur’s Seat. In the living room, you’ll also find a double sofa bed (ideal for the kids), large flat screen television and small breakfast table. The kitchen leads off from the living room and provides everything you need for a comfortable, self-catering Edinburgh stay. Cook a delightful meal using the large oven and ceramic hob or warm up leftovers in the microwave. There’s also a fridge and freezer, toaster, kettle and coffee maker. 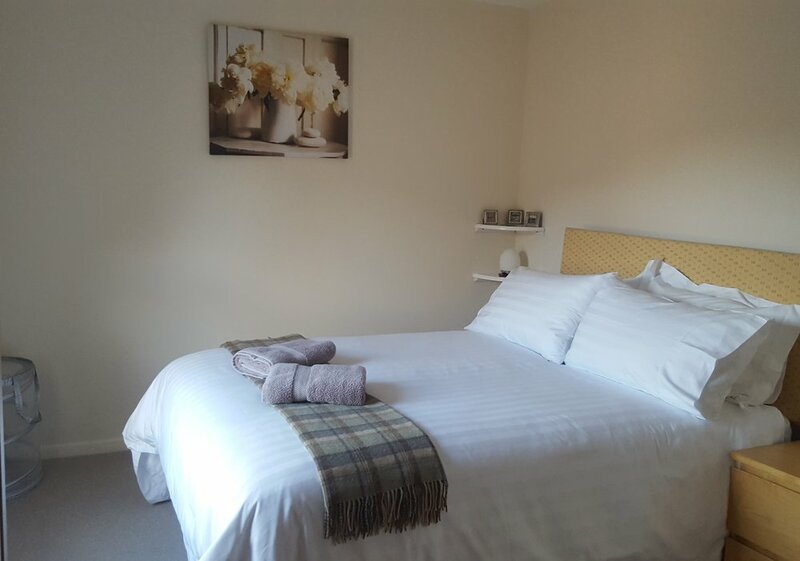 Our luxury holiday apartment comfortably sleeps two in the spacious master bedroom. The master bedroom has a plush double bed, perfect for a peaceful night’s rest. Quality linens and towels are also provided. 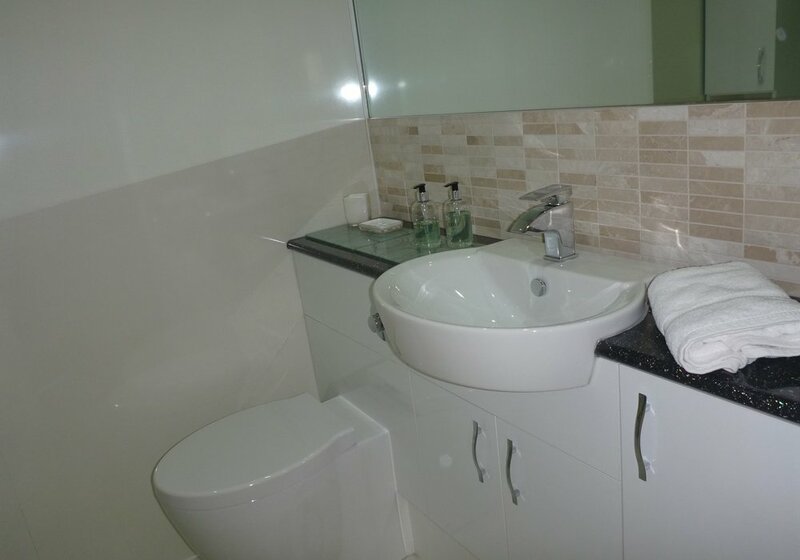 Next to the master bedroom, you’ll find a small bathroom with shower, large mirror and wash basin. When it comes to choosing the ideal holiday accommodation, it’s important to think about the location. Our stylish one-bedroom holiday apartment is not only located within easy walking distance of top Edinburgh attractions, but it’s also in the lovely neighbourhood of Newington on a quiet cul de sac. Newington has many well-rated restaurants and plenty of local facilities like supermarkets, cafes, and banks -- everything you need for an enjoyable self-catering in Edinburgh city centre experience. 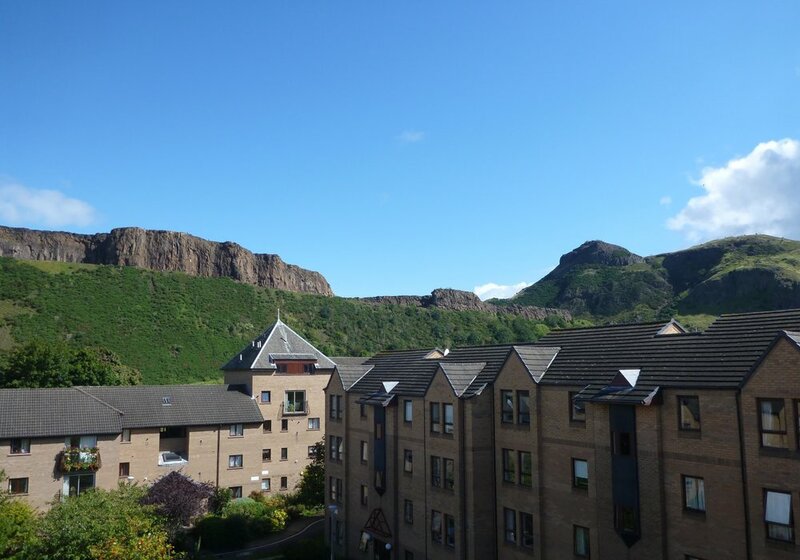 From our one-bedroom holiday apartment, you can walk to the stunning Holyrood Park and climb Arthur’s Seat for breathtaking views over Edinburgh. Or catch a local bus to Leith to explore Edinburgh’s trendiest neighbourhood and the setting for Trainspotting. Edinburgh Castle, Princes Street and the Royal Mile are also within walking distance. Ready to book your next holiday? Our one-bedroom, self-catering apartment in Edinburgh city centre is the perfect choice. We look forward to welcoming you to our beautiful, UNESCO World Heritage city. Travelling to Edinburgh to celebrate an anniversary? We can help make your stay extra special by arranging a bottle of Champagne for your arrival, or even booking a taxi for easy airport transfers. Contact our dedicated property manager to discuss your unique needs and how we can help. Our personal greeter will be on-hand to welcome you to your holiday accommodation and explain the basics of the flat. Check-in starts at 4 pm and you must check-out by 10.30 am. Late arrivals, please enquire in advance. -Full payment is required six weeks before arrival or immediately after booking if booking is within six weeks of arrival date. As our guest, you’ll get a resident permit for a secured car park. So, you can safely park your vehicle and enjoy exploring our beautiful city without worrying about parking or driving! A flat in excellent condition and extremely well catered for. All facilities were modern and clean. Excellent views of Holyrood park and extremely well placed to explore Edinburgh. A very pleasant , quiet location. The only thing I hated about this darling flat was having to close the door for the last time! My three weeks living here were wonderful. 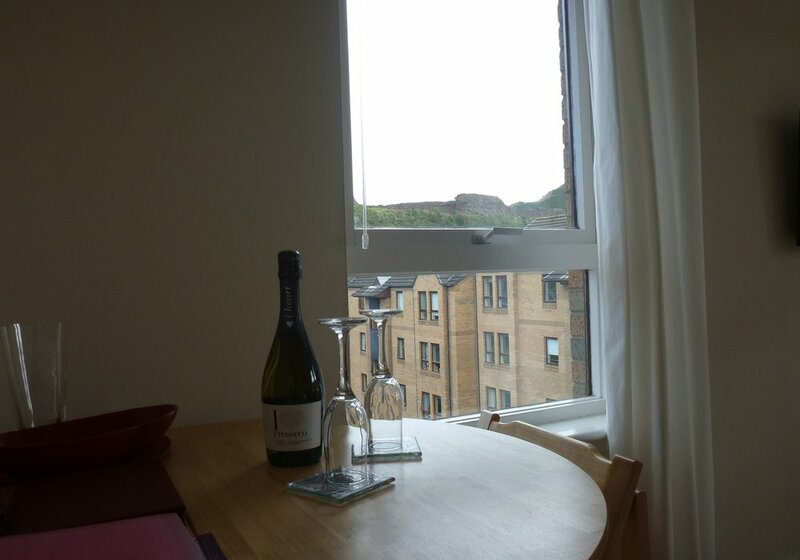 As others have said, it is appointed with all the comforts of home, the view of Salisbury Crags is mesmerizing at any time of day, and the complex is quiet and safe. I did not have a car, and the flat was convenient to bus stops, local grocers, some nice coffee houses, the Abbey Whisky Bar and Pub, and the University buildings where I was working. Holyrood Park with all its lovely walking trails is just a stone's throw away. The flat's owners were delightful, welcoming, and helpful. I will be back for more work next summer and hope to book "my" little flat again! 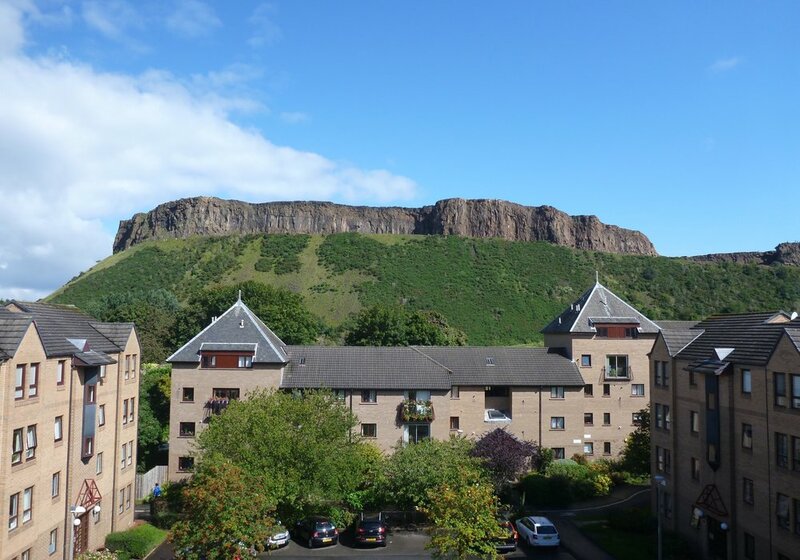 The flat is located just beneath Arthur's seat. From the living room you have a great view. There is almost no traffic so it's very quiet. Nevertheless, it's just about a 15 minutes walk to the old city centre. Free parking next to the flat is also available. The flat is very tidy and cosy and there is everything you need. From linens, towels and a hair dryer to pans, pons and a gratin dish. There is also a good wi-fi connection and a TV with a DVD player and some DVDs. We had an excellent stay with 3 persons. 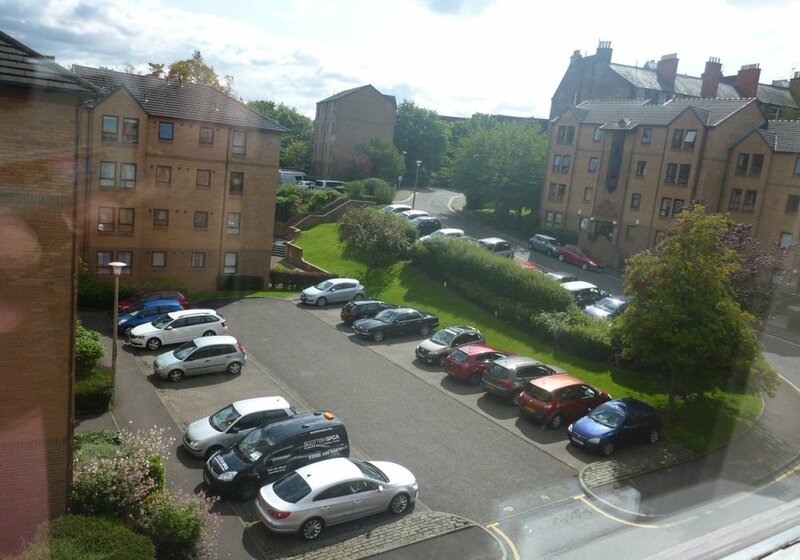 Flat is centrally situated with lovely view of Arthur's Seat. It is clean and tidy and fully equipped for a great stay in Edinburgh, including the use of a parking permit. This was our second time in the flat while visiting the Festival so would thoroughly recommend it for a stay.We will be going back there. Dear Lenore & Janet Thank you for giving us a splendid holiday by staying in your well equipped apartment. It was really like being in our own house. The layout & design of the apartment is really to our liking. The distance between it to the city centre is also favourable to us. We would definitely consider to stay in this apartment in the future. 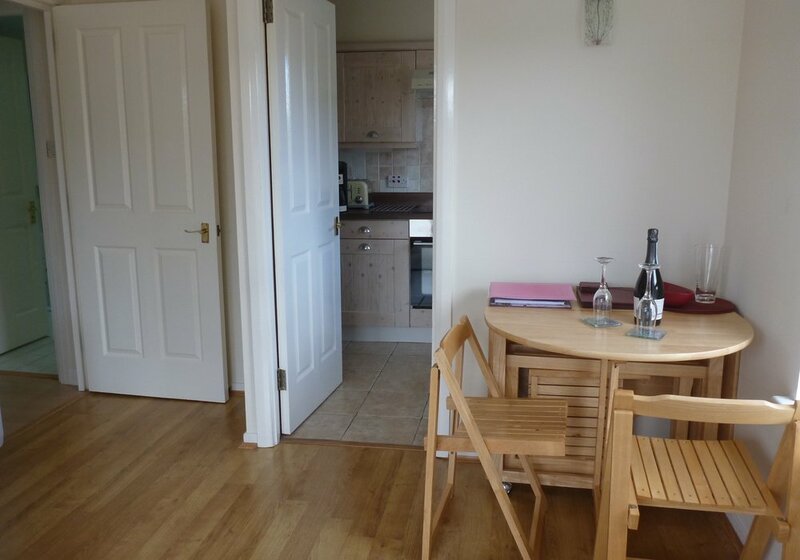 Very clean and tidy,handy to shops and buses.Very nice to arrive and find tea ,coffee ,milk available .We enjoyed our stay and would certainly recommend this flat to our friends ,thank you for a lovely stay. Impressive third floor (top )flat, modern, clean and wonderful outlook. Resident's parking is a great advantage. Lovely furnishings and well equipped. 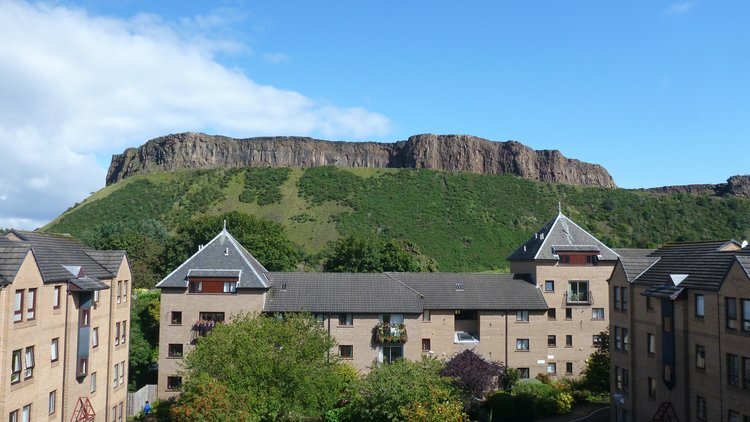 Very convenient for all facilities including buses, not far from city centre and very well located for walks in Holyrood Park, Arthur's Seat and Salisbury Crags. This flat was ideal for anyone who wants to visit Edinburgh. The location was excellent - only 20 minutes walk from the Royal Mile, very quiet and a beautiful view of Arthur's Seat/Salisbury Crags. It is clean and has all the amenities to make it a very enjoyable stay. Particularly handy was the all-in-one washer/dryer for laundry which meant we didn't have to pack as many clothes or take a lot of dirty laundry back home. Although some of the appliances work differently than we are used to in North America, there were lots of instructions available for everything, so it was easy to figure out. Also convenient was the extensive collection of tourist brochures and books about the area. The whole process for booking and refunding the damage deposit was efficient and easy. I would definitely stay here again and strongly recommend this flat for anyone visiting Edinburgh. We loved this little flat. It's furnished comfortably, everything you need is provided: coffee machine, washing machine, microwave, TV and Wifi, hairdryer and soft towels, even tea in the kitchen and milk in the fridge. :-) We especially loved being in the city but living in a quiet neighbourhood. The view out of the window is spectacular. You can walk to all the important places in the city centre and you can start jogging or cycling right in front of the house. We greatly recommend this flat. 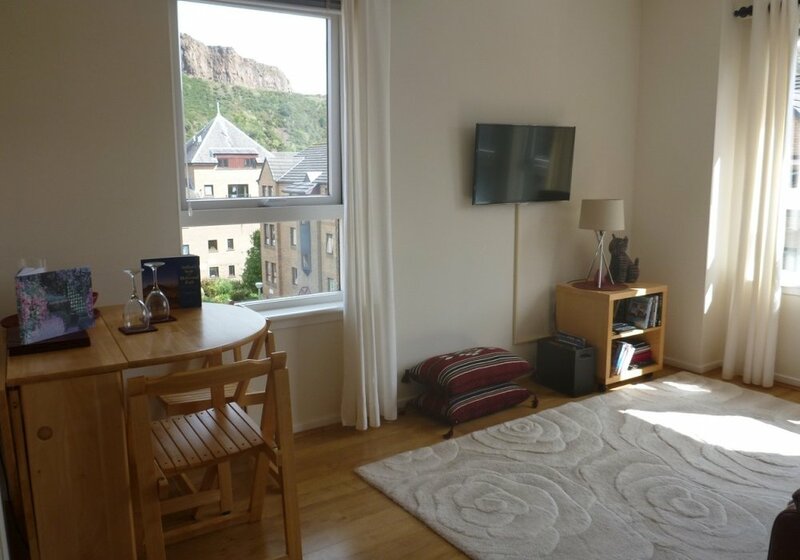 An excellent location with a wonderful view of the Salisbury Crags and Arthur's Seat within an easy 20 minute walk of the centre of Edinburgh. We parked the car outside the flat and it stayed there for most of our stay. We simply walked to the centre of town and all the attractions. An ideal base from which to view Edinburgh. Really comfortable and clean apartment, with everything needed and more. It was absolutely fantastic to stay in the apartment, everything is so clean and looks brand new, the kitchen is fully equipped with everything from forks and knives to coffee machine and cookware. Close to the bus station and easy to get to town. Highly recommended! 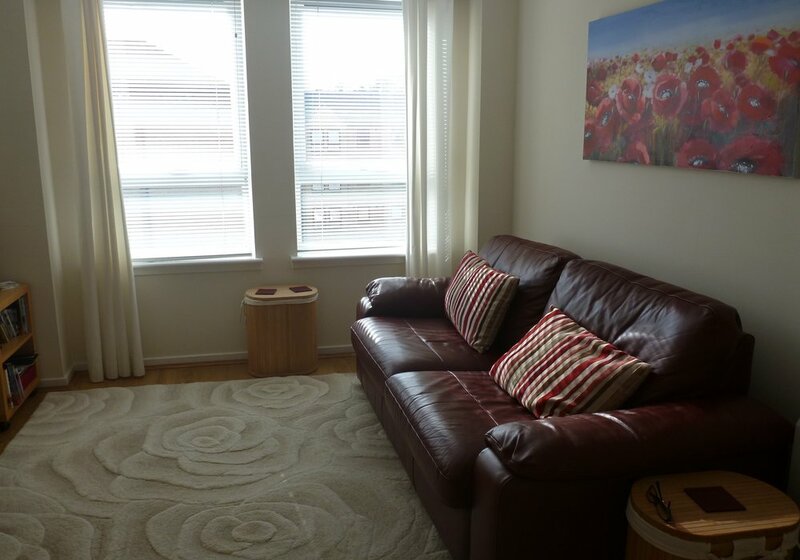 We thought this apartment was really nice, warm and cosy and fitted out to a high standard. The location was perfect for us, just out of the centre but within walking distance. Good selection of pubs and places to eat nearby and right next to Holyrood Park. Parking right outside with its own permit added to the convenience. The apartment was nice and quiet with a great view. Would definitely recommend. 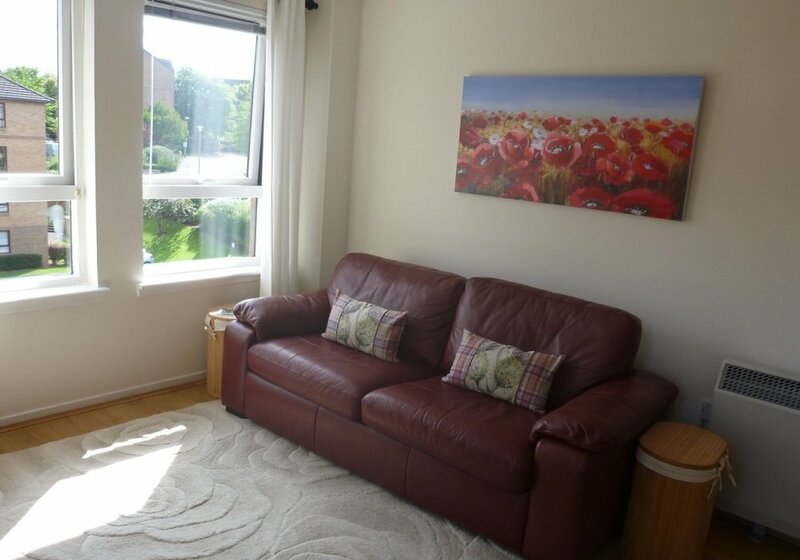 My stay in this flat was fantastic, it is just a short walk to the pathways around Arthur's Seat, yet it is still only a 20 minute walk to the Royal Mile or Waverly Station. It's in great shape, had everything I needed in it and is in a quiet neighbourhood, I would definitely stay here again. We thoroughly enjoyed our stay in this flat. It is bright, airy and clean. It has a fantastic view of Salisbury Grags and King Aurther's seat! The flat is comfortable and well equipped. There was plenty of space for our family of four. The flat is also well located being close to shops, restaurants and transport. Really fab flat, great location, clean and everything we wanted. Brilliant contact and all went really smoothly. The pictures don't show what a great location the flat is situated! The area is quiet and secure and the view is breath taking!!!!! Close enough to the old town and not too far from the rest. The flat has everything you can think off and I had a great, comfortable stay. I walked up Arthur's Seat and it has the best view in Edinburgh! Communication with Gillian was excellent (she even went through the trouble of passing me a new parking permit)!!! I highly recommend this property and I will definitely return! We stayed in this flat for nearly a week. The flat is kept tidy and we felt truly like at home. The owners were very nice and helpful. Communication with them was perfect both in personal and via email. We appreciate the welcome package. Flat has everything you need,kitchen is equipped fully as much as living room, bedroom and bathroom. Location is also great. We enjoyed the view at Artur´s seat when having a breakfast. The center of edinburgh is in walking distance. So we managed to save money on travelling. If you are planning a journy to beautiful Edinburgh I would definitely recommend this flat! We had a great time in this flat over New Years 2013. It was just the four of us and it was a good size for that. The hosts were really good and very understanding. Due to bad weather there were some issues with our arrival and we had missed the part in the information booklet that said departure time was 11am. But Gillian was really nice about it, so thank you! The flat is so easy to get to from the centre of town, nice and warm and the beds are extremely comfortable. Would definitely recommend. We had such a lovely stay here. A brilliantly well-equipped flat. The owners have thought of everything and made this a really cosy place to stay. Very convenient location, very warm welcome. We will be back! Beautiful flat very close to old town (10 minutes walking). Gillian was ver nice when I arrived and always asking if was everything OK. I will repeat! Thank you very much Gillian!! The flat was perfect. The decor was very pleasant as was the location. Everything we needed was there, the attention to little details was refreshing. Both beds were very comfortable and the owners are very personable. I would definately like to book this flat again. I would also like to rate Edinburgh flats highly for their professionalism . We stayed at this 1 bed flat in early May '13. Initially we thought it was further from the centre than we wanted but in fact you can walk to Princes St in 20 minutes and the buses in nearby South Clerk St are very plentiful. You can also easily walk to Tollcross through the pleasant Meadows in about 20-30 minutes. The flat is on the 3rd floor but not a difficult climb at all for an able-bodied person. The views of Arthur's Seat and Salisbury Crags from the living room are spectacular and make you want to get out and climb 'em. Actually the walk to the very top takes about 30 minutes, well worth it as you get a 360 deg view of Edinburgh and even on a dull day you can see Fife and East Lothian easily. Gillian and Alistair have done everything (and more) to make visitors welcome and the attention to detail is fantastic. We shall be back! This very comfortable 1 bedroom flat in Newington is very well positioned for travelling into town. It also has a very pleasant outlook over Arthur Seat. The decor is clean and bright and this flat is well equipped in all rooms. Holyrood Palace is walkable through the park. We would recommend this flat to our friends.